A bill passed by the Turkish parliament last week could give authorities new powers to prosecute doctors for giving unauthorized care (Photo Credit: Marco Longari/AFP/Getty Images). One of the most shocking aspects of Turkey’s violent crackdown on peaceful protest has been the willingness of authorities to target medical personnel. Since then, not only have authorities not been held responsible, but the government has moved to increase legal pressure on medical personnel. Amnesty has played a central role in researching this abuse. 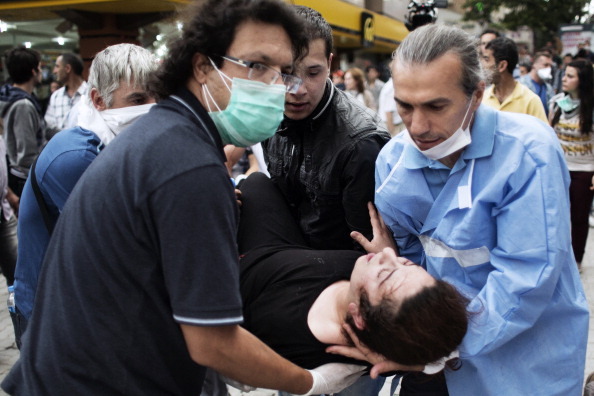 In its report on the Gezi Protests, Amnesty researchers describe in detail the extent to which those caring for the injured were themselves subject to police abuse. Soon after the bill was passed Physicians for Human Rights issued a statement condemning it and calling on President Gul not to sign it. The U.N. Special Rapporteur on the right to health, Anand Grover, and the World Medical Association (WMA) have also raised concerns about the bill. The worldwide condemnation is clear. It is now up to Turkish authorities to do what is right. This entry was posted in Censorship and Free Speech, Europe, Military, Police and Arms, Security and Human Rights, United Nations and tagged abuses by armed groups, censorship and free speech, detention and imprisonment, Europe, Military Police and Arms, right to organize, Turkey, United Nations. Security with Human Rights by Howard Eissenstat. Bookmark the permalink.